Taekwondo is an excellent martial art for teaching the little ones about life skills and getting them started on goal setting. 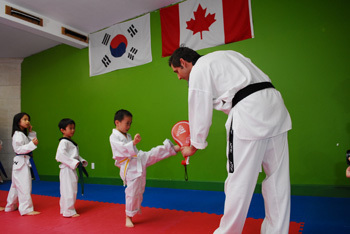 Taekwondo in Burnaby, first begins to build on the child's character instead of their physical prowess. In the beginning, it may seem all cute and hopeless until the moment comes when things start to “click” and you see your child steam roll into an excellent little martial artist and confident little man or woman. Our Martial Arts Program is tailored to small children between the ages of 4 and 7 years old. As far as martial arts for kids is concerned, our primary emphasis in the class is on respect and basically getting the small children to come out of their “shells”. Basic self-defense is taught as well as poomse (patterns) and one-step sparring (a repetitive set of pre-arranged self-defense techniques). Boxing, joint locking and anything seemingly dangerous is taken out of the curriculum and taught to the students at an older age or higher level. Metro Performance Taekwondo Studio in Burnaby makes use of the BULLY SAFE KIDS approach, which teaches children skills on how to deal with teasing, bullying, and mean spirited kids in a non-aggressive way. Bully Safe Kids resolve conflict peacefully by remaining C A L M during any incident of conflict. L - Look at the teaser straight in the eye. Metro Taekwondo students shows confidence by holding their head high. Children should not have an intimidated, slouched appearance. Bullies feed upon this. Our junior classes are for ages between 8 and 12 years old. These students differ from the little ninjas in the sense that they are exposed to the full curriculum and are expected to perform at a much higher level. The emphasis in this class is on discipline, technique and physical fitness. In this class, green belt and above, are introduced to sparring drills, boxing drills, nunchaku training, single stick forms and more elaborate self-defense techniques.